Be the talk of the town with our custom app. Managing events at your convention center, attracting new clients, and managing event calendars can be a challenge! Keeping on top of the "orchestrated chaos", last minute changes, and venue issues are the norm. 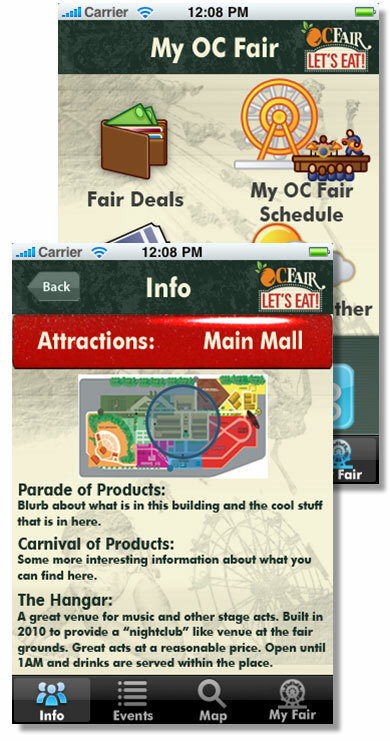 How do you provide quick, timely and accurate information to your event or trade show attendees? Printing is costly, slow and laborious, bullhorns only work so far, and PA systems sound like Charlie Brown's teachers. Using Studio Tiga proprietary mobile platform it is quick and easy to update the app, so last minute changes are simply a matter of the push of a button. Is there a way to provide your attendees quick and easy access to a map of the grounds or help them to locate an area of their interest inside your facility? Need to update the venue location for new events and speakers? How about directions via GPS technology to navigate clients or teammates to your next meeting, or even back to their car. Studio Tiga's proprietary mobile platform allows you to update and distribute this information simultaneously to your Apple app, Android app, mobile site and company website. Use our analytics tools to understand how your clients are interacting with your product. Unlike a static print catalog, now you can understand the number of times your app is downloaded, what pages are popular, how long the page is viewed. Also, learn from your app by studying the usage to see what attractions are most popular, as well as what users are looking for. It has never been so easy to stay in touch with your audience and better understand them. If only pets were so easy. © 2012 Studio Tiga, Inc., All Rights Reserved. Website by Studio Tiga . This website best viewed in Firefox.